Nam Ha Prison is located among remote limestone hills in northern Ha Nam province. Torture and mistreatment of political and religious detainees and prisoners is primarily carried out by law enforcement officials under the authority of the Ministry of Public Security’s Department of Criminal Sentence Execution and Judicial Support (previously known as V26, now General Department VIII). They include prison officials, wardens, and guards, as well as provincial, district, commune, and municipal police officers. In some cases torture is carried out in prisons and detention centers by inmates or detainees authorized by police and prison officials to carry out beatings of political and religious prisoners. Torture is also carried out by soldiers on military bases under the authority of the Ministry of Defense, and by members of the civil defense forces (dan phong), a voluntary security force under the authority of village People's Committee officials that often collaborates with local police. In Saigon (Ho Chi Minh City), political and religious detainees are sent for pre-trial detention at B34 Detention Center, operated by the Ministry of Public Security (MPS) Security Investigation Department or to detention centers under the oversight of the municipal police such as Phan Dang Luu Police Detention Center or Chi Hoa Prison and Police Detention Center. In Hanoi, they may be sent for pre-trial detention at MPS Detention Center B14 (Thanh Liet) or to Detention Center No. 1 (Tu Liem), operated by the municipal police in Tu Liem district of Hanoi. 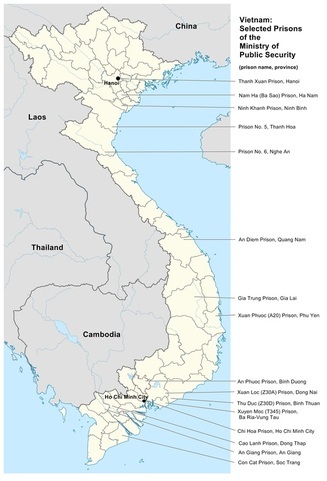 Dissidents arrested in provinces far from Hanoi or Saigon are often detained in provincial prisons or police detention centers for pre-trial investigation and interrogation, sometimes with the participation of MPS officials from Hanoi. * For a list of detention centers where political and religious detainees are held, click here. National prisons under MPS General Department VIII that have designated sections for convicted political and religious prisoners, where they are sometimes held together with common criminals, include: Nam Ha Prison in Ha Nam province, Prison No. 5 in Thanh Hoa, Xuan Phuoc (A20) Prison in Phu Yen, Xuan Loc (Z30A) Prison in Dong Nai, Thu Duc (Z30D) Prison in Binh Thuan, Prison No. 6 in Nghe An, and Xuyen Moc (T345) Prison in Ba Ria-Vung Tau. * For a map showing the locations of selected MPS prisons, click here. Political and religious dissidents have also been arbitrarily detained without trial in re-education camps (Co So Giao Duc, or CSGD), including A1 Re-Education Camp in Phu Yen, Ayun Pa Re-Education Camp in Gia Lai, Dac Tan Re-Education Camp in Dak Lak, and Thanh Ha Re-Education Camp in Vinh Phuc. For a listing of detention centers where political and religious detainees are held, click here. To see the locations of prisons where prisoners of conscience are held, click here, or click on the map below to see a larger map. ​Excerpted from "Vietnam: Torture and Abuse of Political and Religious Prisoners," Campaign to Abolish Torture in Vietnam, 2014.